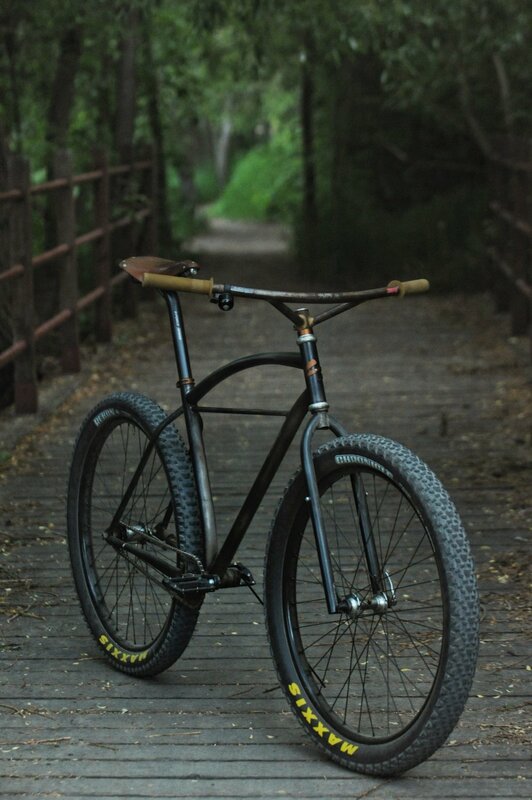 Weedeknd Projects - my 27.5+ Klunker — Sklar | Handmade Bicycle Frames. Mountain, Cyclocross bikes built to order. Fast forward a few years to last weekend when I was looking at my new bending setup for unicrown forks. When I first started building frames I mostly used unicrown fork blades. I like the simplicity, the way they ride and the major weight savings over a segmented fork. That said, sourcing pre-bent unicrown blades from bicycle tubing manufacturers is challenging as there just aren't enough options out there for the variety of bikes I build. So I quickly switched to the segmented forks you will notice on most of the rigid bikes I build... Until now. I finally had the tooling to bend my own blades, but first I needed to build a test fork. And I did! And well then a frame to go with it. So that is what we have here. A modern classic - Fun mountain geometry, big tire clearance, and coaster brake only. Pretty cool. I have had a lot of interest in these frames so if you are interested I can build you one in a stock size - either Small (16") or M/L (19.5") Frame + Fork for $2500. Send an email to adam@sklarbikes.com or give me a phone call for more info.